We have finally released the curriculum that Progressive Language uses when we teach preschool and kindergarten Spanish. This manual provides detailed plans for a 32-week program, broken down into 16 lessons. Each lesson includes a minute-by-minute class plan, a curriculum that provides a variety of activities for the two week period, and a send home activity sheet so families know what your teaching and have activities they can do at home to reinforce Spanish. The Resource CD contains 30 images that are used throughout the program, certificates and assessments. 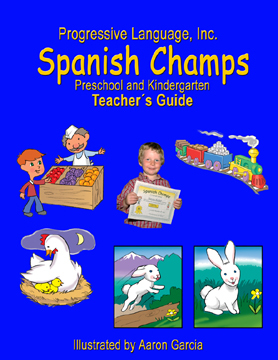 Click the button below to add the Spanish Preschool Curriculum Guide Book to your wish list.